There are a number of different ways that molecules can pass from one side of a cell membrane to the other. Some such means, like diffusion and osmosis, are natural processes that require no expenditure of energy from the cell and are called passive transport. Other methods of transport do require cellular energy and are called active transport. In addition to these two forms of transport, there exist other forms of transport such as endocytosis and exocytosis, which will be discuss later and do not require the same set of membrane proteins for their function. In this unit will be looking at how things move “Into and Out of Cells”. The cell membrane (plasma membrane) is a thin semi-permeable membrane that surrounds the cytoplasm of a cell. Its function is to protect the integrity of the interior of the cell by allowing certain substances into the cell, while keeping other substances out. 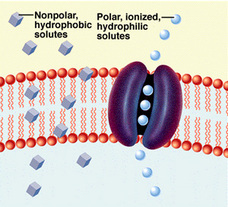 Phospholipids form a lipid bilayer in which their hydrophillic (attracted to water) head areas spontaneously arrange to face the aqueous cytosol and the extracellular fluid, while their hydrophobic (repelled by water) tail areas face away from the cytosol and extracellular fluid. The lipid bilayer is semi-permeable, allowing only certain molecules to diffuse across the membrane. Active transport requires the cell to spend energy, usually in the form of ATP. Examples include transport of large molecules (non-lipid soluble) and the sodium-potassium pump. Diffusion is the net movement of a substance (liquid or gas) from an area of higher concentration to one of lower concentration. 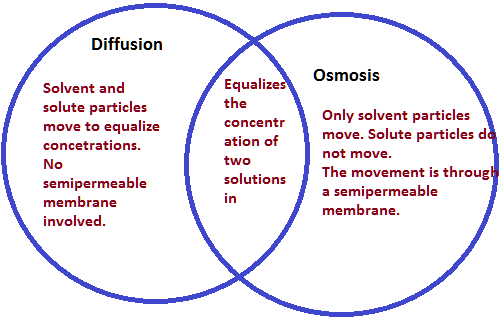 Osmosis is the diffusion of water across a semi-permeable (or differentially permeable or selectively permeable) membrane. Cell membranes act as barriers to most, but not all, molecules. Development of a cell membrane that could allow some materials to pass while constraining the movement of other molecules was a major step in the evolution of the cell. Cell membranes are differentially (or semi-) permeable barriers separating the inner cellular environment from the outer cellular (or external) environment. Water potential is the tendency of water to move from an area of higher concentration to one of lower concentration. Energy exists in two forms: potential and kinetic. Water molecules move according to differences in potential energy between where they are and where they are going. need to take in useful substances and remove other substances, such as waste, in order to function effectively. Water is very important in supporting a plant. Water enters cells by osmosis. This makes the cell swell and become firm, due to the increased pressure inside the cell. This pressure pushes against the cell wall. The cell wall is strong enough to withstand this pressure, so it does not burst. The cell is said to be turgid or firm. When lots of plant cells are turgid they push against each other and support the plant. If a plant is short of water it begins to wilt. This is because the cells lose water and become soft or flaccid. The vacuole is smaller and the pressure inside the cell is low so the cells do not push against each other to provide support. Temperature - The higher the temperature, the faster the movement of water molecules across the semi permeable membrane. Surface Area - The larger the surface area, the more space for the molecules to move easily across; the smaller the area, the more restricted the movements of the molecules and the slower the movement. Difference in Water Potential – The higher the difference in water potential, the faster the osmosis; for the lesser water molecules are in the region of low concentration, more water molecules from the region of higher concentration can enter faster and easier. Pressure – The more the pressure, the faster the molecules will move for they are being pushed faster across a low concentration. Concentration gradient - The movement of osmosis is affected by the concentration gradient; the lower the concentration of the solute within a solvent, the faster osmosis will occur in that solvent. Active transport occurs when a cell actively pumps a molecule across its membrane, against the natural direction dictated by diffusion, osmosis, or polarity. As seen in , such transport requires energy. The Amoeba Sisters explain the fundamentals of osmosis before walking you through some real world examples. Come learn about the process that can mean life or death for slugs, saltwater fish, and plants!